Today's spinning looks like yesterday's, except that the bag is S-L-O-W-L-Y getting emptier as tiny blue bumps are being replaced by even tinier plastic weaving bobbins that are full of blue singles. I spun a little over 1 oz today, which keeps me delightfully ahead of schedule. Given that athletes need good nutrition, so I made my favorite Texas Beef Chili. The recipe comes from a Williams Sonoma cookbook that I picked up at the Recycle Bookstore in Campbell, my favorite place to buy used cookbooks. It's delicious, and has taught me a few things in the kitchen. - Cubing frozen meat is easier than trying to thaw it out, then cube it. - No matter what, I'm going to get spattered. Even if I'm not cooking. - Mise en place. Do it; it makes your kitchen run like a well-olive-oiled machine. - No matter how good your dish is, if your dessert isn't just as good, you may as well have served generic dog kibble. Halve the mango along the pit. Porcupine it carefully, making sure not to puncture the skin. Shave the porcupine; waste not, want not, give that porcupine the Brazilian treatment! Slice the strawberries thinly. 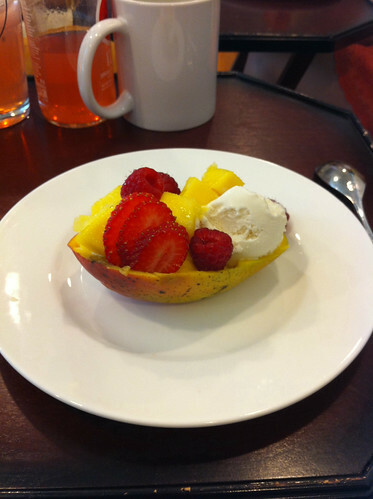 Put 2 scoops of ice cream in each empty half of the mango skin, generously dress the ice cream in mango cubes, raspberries, and garnish with sliced strawberries and a mint leaf. I'm drooling. Gonna get me some of those fruity ingredients later today. Looks like the perfect antidote to our incredible east coast heat wave.